Discussion in 'Public Events' started by Lina, Nov 8, 2018. Yule is getting nearer, and what better thing to do than to make a large drawing to greet yer friends a very merry yuletide? Not much! So here we go! This is the second meetup to make this year's yule drawing for the Laurelin hobbits! Yule is getting nearer, and what better thing to do than to make a large drawing to greet yer friends a very merry yuletide? Not much! So here we go! This is the first meetup to make this year's yule drawing for the Laurelin hobbits! Once again, I’d like to make a yule video with as many hobbit players on Laurelin as possible. The video will be released near yule. The second is shoot is Tuesday December 11, location Thorin's Gate. 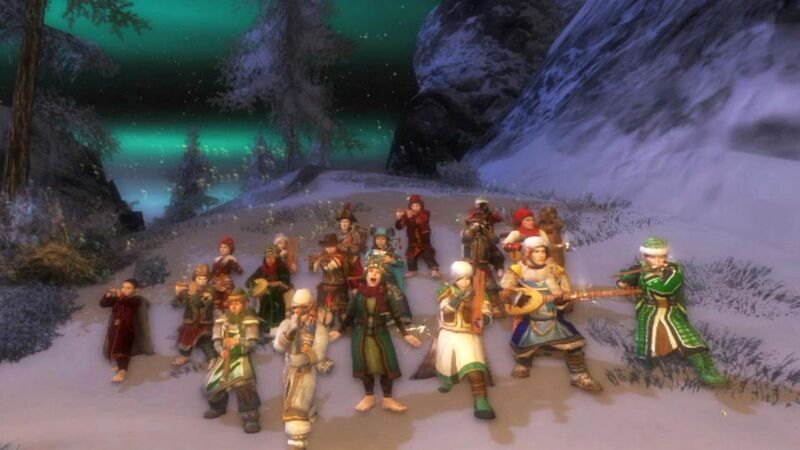 Also, I’d love it if yer hobbits sent me a screenshot of yourself in-game, in a festive/merry/yule motive. I can use those in the end credits of the video. Please use high-quality screenshots (1024×768 pixels is really the minimum, but larger is much better), and don’t add any effects or text to the image. Be prepared to follow orders! For inspiration, here is the yule video from last year. Oops, I think you left out a "1"!